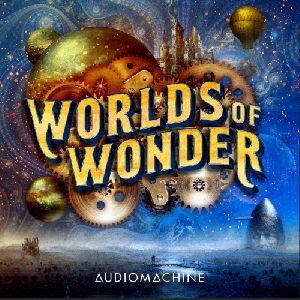 Worlds of Wonder is a celebration of magic, mystery and mayhem. A musical elixir concocted at legendary Abbey Road Studios from the fantastical mind of Audiomachine. Tense, mysterious strings layer with mystical female vocals. Lilting chimes and dancing piano join dancing percussion, magical bells and rhythmic, arpeggiated strings in a mesmerizing melody. Bold brass comes in with a full choir and lush orchestra. Light, mischievous strings, magical bells and dancing, adventurous brass lead in to insistent drums and fleeting woodwinds setting an exciting pace; sliding brass and choir stabs create an action-packed, heroic outro. Mysterious and magical chimes dance lightly over lush strings, casting a spell which may or may not go awry. Bold brass shows our hero bravely fighting against forces he doesn't understand, but with all those orchestral stabs, he might still prevail. The fall down the rabbit hole is a bumpy one. Driving brass, orchestral and choir stabs, and stomping percussion set the pace for a wild ride. It's a romp through darkly magical lands with mysterious characters - and not all of them want to help Alice. Sweet bells chime a mysterious intro, while plucked strings tick and an angelic choir swells. Driving strings begin while woodwinds and chimes dance. Building with bold brass and percussion to a sweeping, ominous and massive climax with huge stabs. Chiming and mysterious plucked bells, tense cellos, and choir introduce a lilting and off-kilter string motif, stopping down for a sweeping but dastardly waltz, only to kick back in with a rollicking, exciting and mischievous high seas adventure. Twinkling, magical intro leads to driving, zany and off-kilter romp with lilting woodwinds, serious choir, bold brass and driving strings. Builds to a darkly mysterious and dangerous pounding, stabbing and hugely climactic back end. A magical ride through a mysterious realm. Leading with insistent strings, an off-kilter brass motif and choir, careening frantically through all the rooms of a haunted mansion, building with anticipatory orchestral stabs to a big adventure ending. Quick and mischievous strings dance like mice across the floor. Orchestral stabs create a fun tension while the strings play with your imagination and the brass drives the energy forward, all the way to an epic, mysterious, magical and wild end. Mischievous piano, strings and woodwinds play with twinkling harp and bells while sharp, darkly heroic brass and percussion stabs punctuate this magical dance. It's an exciting, wild ride, building with ascending brass stabs and a huge outro. Sharp strings, low bassoon and darkly heroic brass make for a mischievous intro. Orchestral stabs punch through as strings and brass drive wildly through a haunted mansion of tricks. Cymbals and stomping percussion build to a fun, exciting back end. A fast, fun, and wacky ride through toyland, this off-kilter track zigs and zags with driving strings and brass. Stopping down with orchestral stabs and transitioning into a zany cruise through Santa's workshop, then out to a romping back end climax. Mysterious piano, bells and tense, tremolo strings twinkle and swell, revealing a darkly heroic and foreboding brass theme. Ominous and tense, ostinato strings drive the tempo, building with massive percussion and ascending brass to a huge climax. Unsettling piano and a sinister drone build with dark cellos and dissonant strings, twisting together in a magical waltz. Unholy choir, bold brass and pounding percussion stomp and sway, building to a heroic attempt to fight off this dark spell. Darkly mysterious and magical chimes, haunting piano and choir swirl together; a pulsing synth slithers, churning with insistent strings, menacing brass and percussion, building gradually to an ominous and powerful back end with orchestral stabs. Insistent strings and a mischievous brass motif lead the charge to wonder and excitement. Bold percussion layers in, pushing faster, pounding an unrelenting tempo to an astounding back end with lots of orchestral stabs. Swirling strings and magical, mysterious arpeggiated harp layer over ominous timpani rolls and dark brass building gradually to a tense, spy-feeling section, transitioning to a darkly heroic, brass motif that builds in intensity to a massive climax. Solemn but bold driving strings and serious brass swells with choir. Transitions to a stately, serious processional tempo with high ostinato strings and crashing cymbals. Restrained and somber, but builds to an epic climax with orchestral stabs. Pounding timpani and crashing cymbals mix with driving, tense strings and bold, darkly heroic brass building to a massive, powerful climax. Dark and driving cello layers over insistent low taikos, building with the mighty orchestra. Mighty choir lends heft and urgency to the tension. Huge stabs blast with choir, brass, and ascending strings for a truly epic climax. Low, urgent, insistent strings drive the tempo while bold brass shows that our hero is up to the challenge. Driving percussion and tense orchestral stabs play over ostinato strings, building with action strings and brass theme to a massive, epic end. Huge action orchestral stabs, pounding percussion and driving strings create a relentless and exciting intro. Timeless heroic spy, chase scene, or fighting on top of a train or between two moving cars, pulse-pounding, important and absolutely epic. A magical and mysterious, swirling intro with angelic choir, arpeggiated piano and strings, builds and swells, revealing a wondrous world which transitions into a glorious and celebratory, sweeping and lush, heroic back end. It's sunrise on the big day. Anticipatory strings, choir and inspirational heroic brass greet the dawn. The choir chants a rousing chorus while piano and strings dance and swell with triumph. Building to a soaring, majestic and Olympic style climax. The champions take the field in slow motion while the crowd cheers, proudly waving banners. The celebration is complete with brass fanfares and lush, inspiring strings. Inspirational and soaring, this triumphant theme builds to a powerful outro. Magical bells and mysterious choir dance over plucked strings and swell with brass and cellos. Transitions to a lighter, off kilter family waltz, swirling with stately orchestra, bells, mischievous choir and ceremonial brass. Light, magical and twinkling choir and chimes sprinkle starlight, bringing adventure in with bold, happy brass and lilting, energetic strings. The wonder swells and builds, driving with joy and excitement to a massive orchestral stabbing back end. Sparkling bells and piano create a light intro with shakers and percussion. Cellos and inspirational percussion mix with soaring female vocals, lush orchestra swells with inspiring drums. Heroic brass layers in, building a sweeping, epic back end. Soaring, proud and patriotic, this is a moment of glory. Sweeping strings, brass, crashing cymbals and low percussion accents lead this ceremonial procession, rolling and swelling with triumphant inspiration. Celebratory and bright strings, triumphant and warm brass and quick-paced percussion build with a sweeping and cinematic tone, lush choirs and crashing cymbals usher in a huge, inspirational back end with orchestral stabs. Sweet piano, lush cellos and light woodwinds dance magically over majestic brass, rolling timpani, an angelic choir and warm strings. Crashing cymbals create a cinematic swell, building to a beautiful and emotional climax. A simple yet beautiful piano motif builds with a swell to a joyful moment of love and celebration. Sweeping strings, glorious choir and inspirational brass lift and build to a soaring crescendo. Calm, introspective brass theme with beautiful string swells and magical harp accents. Light bells, cymbals and chimes, build gradually with waves of proud, pastoral orchestra to a sweeping, but restrained heroic swell to reveal a wondrous new world.